A new instalment is well overdue. A lot has happened, some good, some not. I’m fitting writing this around trying to process and upload many thousands of photos from the European Masters Indoor Athletics Championships in Gent, Belgium, ten days ago. Forgive me if this piece comes out a bit disjointed, as I flit to and fro. The sheer volume and drudgery of the work is getting me down! I reached the Europeans healthy. That was a big plus. I reached them very un-raced, which wasn’t. Gent was bright and sunny when I got there – it’s only a few hours travel from home – another plus. My first race, the 200m heats, was at 9.20 in the morning. Definitely not plus, but some poor souls had theirs scheduled for 8am. I was flattered to be seeded on past performance in the top 10, and got a really good lane draw in the first round. I also thoroughly enjoyed it, going out very hard, relaxing, and coasting home in second place. Photos I have been sent of the race show me almost serenely calm: mouth closed, shoulders and arms relaxed, stride purposeful. Job done, but I would rue that coasting. The semi-final draw gave me lane 1, the awful inside lane hated by all indoor sprinters. Still, as I said many times, it was only 200m long, just like all the others. I warmed up well. To be honest, I felt good, from head down to feet. I was very focused. I had a guy in the lane outside me who would be an excellent target to chase in the first half of the lap. I was really very relaxed. All that changed 70m away from the gun. I was just getting into gear when my left calf tightened sharply. Brain said “Relax, you’re trying too hard”. Thirty metres further on leg said “Nope, I’m hurt”. I did finish the race, limping badly, and running on my heel. Silly. I ought to have pulled off the track. The following five days saw me as a photographer/spectator/patient of the excellent British Masters Medical Services physios and although I enjoyed myself immensely with the privileged access to track and athletes that goes with being one of the official photographers, I would rather have been racing, of course. Irritation got added to injury on the final day, when my relay team colleagues – the team I should have been a part of – won gold in a very fast time. Should have been me. I am not going to turn this blog into a report of the European Masters Championships. It’s not what I am good at. However, I can’t end my coverage without sharing one of the most life-affirming experiences I had in Gent. I met and photographed 85 year old Carolus Moens, a Belgian high jumper. What’s special, you say? Most big Masters events will have an 85 year old high jumper. Well, the difference is that Carolus has only just taken up high jumping! He had previously been a big name on the Masters tennis circuit. But that’s not all. 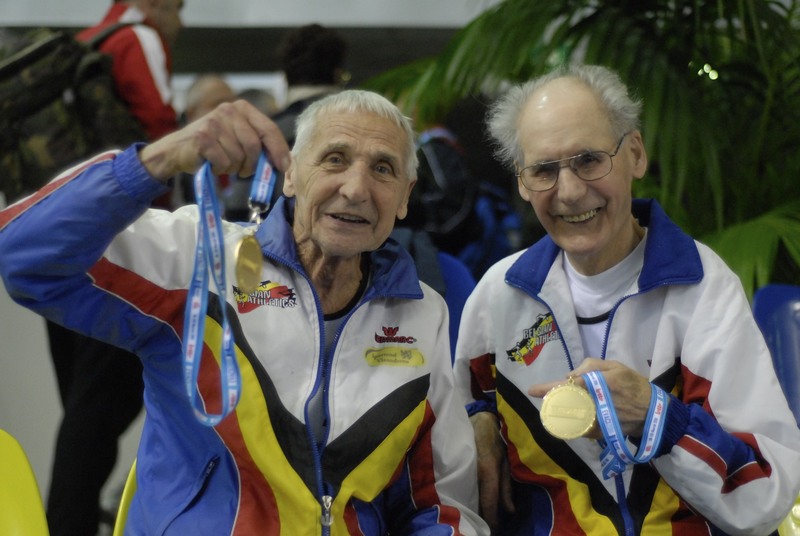 Carolus is coached by 92 year old Belgian Masters star Emil Pauwels. I have included a photo of these two inspirations in this piece. Big thanks are due to all the kind and friendly people who made me feel better in Gent, and to all of those whose performances in the championships filled me with awe. These same people also gave me a certain sense of purposeful anger at how much my form has suffered after a year on antidepressants. Gent is important to me. It was on the trip there to the Belgian Masters Championships in March 2010 that I realized, alone in a hotel room, that my mental health had reached a low ebb that required me to do something about it. And soon. I couldn’t write or talk about it, and probably even managed to seem “ok” on the surface, but I am glad I made that appointment the day after I got home. This time around, injury or not, and sitting in a different hotel, I said to myself that this was another milestone – I really felt ready to have a second go at coming off the pills. This was such a right decision that there was a real spring in my limp as I set out for a meal late that evening. (A typical Gent day began at the track at 8am, and ran through to 11pm of uninterrupted action for several days. There always came a point where I had to abandon in favour of food and sleep.). A pizza later, I was wandering the rain polished cobbles of the city taking photos, and just feeling, well…good. The representative sample of most of the best from 6,700 photos taken in the Championships are almost all on the website at time of writing this piece. Tough job. And I was true to my promise. Three days ago I saw my doctor and agreed with him the phasing of my withdrawal from Citalopram. Seven weeks from now, I should be off it. In 24 hours from now I will be on my way to the European Masters Indoor Athletics Championships, in Ghent, Belgium. Actually, for reasons I have never understood, and which get people very annoyed, the organisers insist on still calling it the “Veterans” championships, but that’s by the by. Normally, I love this event. It comes round every other year. I like indoor athletics, and I have a relay silver medal and a gold medal from the past European Indoors I’ve attended. This will be my third Europeans after Helsinki and Ancona. I’m even top 10 ranked for these champs on past performances. However, I’m going with no sense of anticipation this time, unfortunately. Ordinarily, I’d have raced seven or eight times in preparation, and would be well prepared, with a decent idea what to expect. Not this time. I passed up a very early chance to race in January, and then learned that my favourite winter race series had been cancelled. My diary revealed that the remaining races were pretty much one weekend after the other through February and early March. That was why getting injured just warming up for the first race blew everything else out of the water. I was, frankly, pathetic three weeks later at the Southern Counties Championships; quite the slowest I have ever raced. A 200m bronze medal flattered me. The following weekend was the British Masters, the National Championships. I was bronze medallist here over 60m in 2006. This time, I was lucky to get third in the “B” final. Worse, despite feeling pretty good for the 200m heats early the following morning, a calf muscle tear (other one this time) five minutes before the race, put paid not only to any chance of competing, but seriously compromised training over the next fortnight. I am always a little pleased when an injury like this reveals a whopping great bruise, because it confirms I wasn’t imagining anything. This one was a good’un. No imagination needed, especially when my masseur, Mike, got his well-trained thumbs into it a few days later. Ouch! My pre-European Championship final preparation amounted to two training sessions in the gym. One didn’t really do my calf any favours, the other hurt my foot. I’ve been procrastinating about my packing, as at time of writing, although Tunnel and hotel are all booked. I will be there for a 200m heat at some ungodly hour of Wednesday morning, and will take it from there. I love the Ghent indoor arena, and won the Belgian Championships 60m there in 2010, on a landmark day. Landmark? It was also the day I finally admitted to myself I might be suffering from depression and that I needed to do something about it. I’m GB media crew for these championships. That means a lot of hard work, and tough decisions. The programme runs from 8am to about 11pm most days. Think about the words of the song chosen for the title of this blog, and the reason for the choice may become clear! “Those endless days”…. There is just too much to fit in. The event should have been made a day longer, not a day shorter, than usual. I am bound to miss many events, either through eating, racing, or just fitting in fleeting moments of pleasure talking to my buddies from all over Europe. It is the people who make these events. As a regular photographer and occasionally good-performing athlete, I guess I’ve become pretty well-known. I speak three European languages tolerably well for what I need to do, but have good friends from the Ukraine, Poland and Spain, for example, with whom, when a translator isn’t around, communication is smiles, gestures and pidgin English. The other thing is that this is Masters. The best in Europe, in age groups from 35 to 95 will be there. I’ve not checked the age of the oldest, but some of the real superstars in their 90th decade are always present. That lovely man Ugo Sansonetti (he of the Bertolli and CocaCola adverts on tv) is listed, as is Emiel Pauwels of Belgium, born in 1918. It is always truly life-affirming to see these guys compete. And women. We Brits have some of the best, too. Ghent won’t be a high point of my sporting career, but I guess I’m looking forward to it really. Writing this has helped convince me. You are currently browsing the Blog from a Faster Master blog archives for March, 2011.